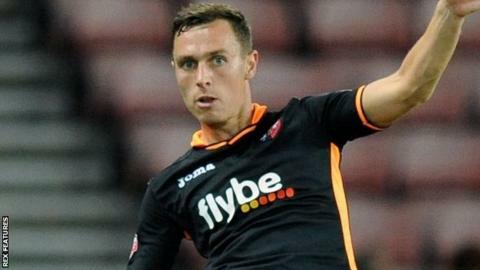 Exeter City defender Jordan Tillson says he is relishing his 'whirlwind' start to the season. The 22-year-old has become a regular fixture in the Exeter first team, making 11 appearances so far. "I've had to come in and take my chances," said Tillson, who was given his chance after Jordan Moore-Taylor broke his foot in pre-season. "Hopefully I can come in and put a bit of a marker down and play as many games as I can," he told BBC Sport. Tillson came through the club's youth ranks and made his debut on the final day of the 2013-14 season in a 2-0 win at Hartlepool. "It's been a bit of a whirlwind start to the season. I'm not the biggest of players so I have to be brighter and try and get into good areas and affect players more than they affect me. "That's the area I've tried to improve on most," he said. Tillson's father Andy was also a centre-back, playing for Queens Park Rangers, Bristol Rovers, GRimsby Town and Walsall, as well as being a coach at Exeter for a time. "He's been a big influence, he comes to as many games as he can and he's always got an opinion to tell me," his son added. "There's always something I can improve on and he's always the first one to tell me, but he's been great as well. "He sees things I can't see and he tells me how to improve it from his experiences in the past."